Unidentified food sensitivities can contribute to many chronic health conditions: including Irritable Bowel Syndrome, Rheumatoid arthritis, headaches, brain fog, fatigue, ADD/ADHD, eczema, chronic ear infections, sinus problems, leaky gut, insomnia and many others. I have partnered with a certified laboratory that uses state of the art technology to identify the offending foods in your diet. Many times the foods we eat frequently and seem healthy are contributing to our health problems. Elimination of the offending foods can improve many health problems and lead to a better quality of life. Testing for 96 foods commonly found in modern Western diets including gluten, dairy, wheat, nuts, and yeast. An easy to read, comprehensive booklet revealing your results in an easy to read format. A four-day rotation, customized elimination diet compiled directly from your test results and a nutrition questionnaire. We will mail a simple finger stick kit with detailed, easy to follow instructions directly to the address you provide. No need to go to a depressing lab or sit in a waiting room for hours! 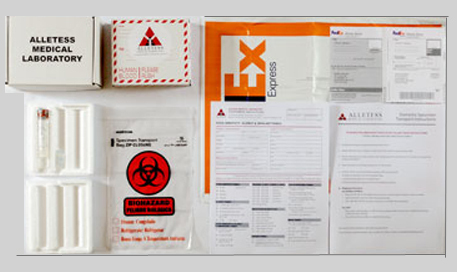 Drop the completed test kit in the enclosed envelope and drop it off at your local FedEx- no need to pay postage. Within 2-3 weeks, we will mail your results directly to your doorstep - It’s easy!